How Recep Tayyip Erdogan gorged on a whole country. … After a mere 90 days as president, Recep Tayyip Erdogan has become the man who has eaten Turkey—the country. He is president and de facto prime minister, making him Turkey’s first “Primesident”—sort of like the political version of Turducken. Yet Erdogan’s powers run even further and deeper. He is also, effectively, the country’s foreign minister and chief judge, a prosecutor and big city mayor, university rector and father figure. 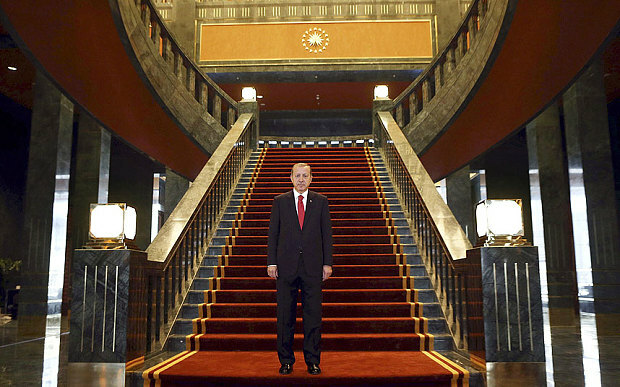 There is nothing that better represents how Erdogan has gorged on Turkey than the president’s own newly unveiled Ak Saray, or White Palace, with its $350-$650 million price tag, 1,000 rooms and more than 2 million square feet. Erdogan was, of course, larger than life before he took the presidential oath of office in August. Since 2007, when then-Foreign Minister Abdullah Gul—the only other adult in the room—became president, Erdogan has been the only person who has really mattered in the Turkish political arena. As prime minister for more than a decade, he achieved this mastery through his finely honed political skills, the incompetence of an out-of-touch and craven opposition, political coercion and fear. Erdogan’s Justice and Development Party (AKP) went from one of the most interesting “post-Islamist” political parties in the Muslim world to little more than a hive of sycophants who elided Turkey’s interests and those of the party into the man’s ambitions. In the process, the party has become more hardline in its role as the vehicle for Erdogan’s authoritarian and even retrograde turn. At a recent conference on women’s rights, Erdogan declared, “You cannot put women and men on equal footing. It is against nature.” This was shocking, even for Erdogan who wondered last summer what Americans knew of Hitler and more recently asserted that Muslims discovered America. By Erdogan’s third term as prime minister, which began in the summer of 2011, the AKP had stuffed Turkey with copious amounts of patronage, making it practically impossible for anyone to mount a challenge to the man. The process of reinforcing Erdogan’s predominance was fairly straightforward: Erdogan encouraged big businesses that wanted lucrative government contracts—mostly in construction—to buy up media outlets, and, in return for good coverage of the government, the lira would flow. Those who refused to play the game were hounded, sued and fined, often exorbitant amounts. The most famous example of this was the $2.5 billion tax fine levied on the Dogan media group, whose owners, editors and journalists refused to be intimidated by Erdogan and the AKP. This is not to downplay Erdogan’s achievements. He has certainly broadened Turkish politics to include classes that the previous elite had little interest in, and provided them with health care, better infrastructure and improved transportation. Turks have also felt wealthier since the AKP came to power, thanks to economic growth and the availability of consumer credit. Erdogan was also highly regarded in Washington, which considered his pious politics in an officially secular political order a Muslim “third way” that was an example to Arab countries. The European Union even rewarded Turkey with an official invitation to begin membership negotiation after Erdogan oversaw wide-ranging political reforms in 2003-2004. But Erdogan has rolled back many of these liberalizing changes, using the state at his command to crack down on dissent, intimidate his opponents and—perhaps above all—enrich and empower himself. For all his political dominance, as prime minister he was still just the head of government, not the head of state. Steven A. Cook is the Hasib J. Sabbagh senior fellow for Middle Eastern Studies at the Council on Foreign Relations. Is something happening within the Turkish government? That was one of the most popular questions among guests attending the ceremony in the Palais de France in Istanbul on Nov. 11, where French Ambassador Laurent Bili presented a Legion D’Honneur medal to one of Turkey’s leading industrialists, Bülent Eczacıbaşı, for his contributions to both Turkish-French relations and to cultural life in Turkey. Given the government-dominated political atmosphere in Turkey nowadays, the question might be a dangerous one to ask in public. Still, it remains a matter of curiosity because of continuing signals from within the government. The fact that President Tayyip Erdoğan has been delivering no fewer speeches than his time as prime minister and chairman of the ruling Justice and Development Party (AK Parti), and the fact that his words are equally political, slamming the opposition parties just like he did before – despite his constitutionally bi-partisan status – is only part of it. He did not hide the fact that he was going to be a more active president who would not leave government affairs to the prime minister only; so his active stance was something expected, even if it overshadows Prime Minister Ahmet Davutoğlu from time to time. But there are more indications than the frequent speeches. The first was about the appointment of Davutoğlu’s undersecretary. Erdoğan would have liked to see Davutoğlu keep his last trusted undersecretary, Fahri Kasırga, but Davutoğlu’s choice was to bring in Gökhan Çetinsaya, the head of Turkey’s Higher Education Board (YÖK). The end result was the appointment of Kemal Madenoğlu, a former undersecretary of the Development Ministry, whose most recent job was to monitor the construction of the new $615-million Presidential Palace. Madenoğlu was approved by Erdoğan as Davutoğlu’s undersecretary, Çetinsaya was removed from office and hired by Davutoğlu to his team of advisors, and Erdoğan replaced Çetinsaya as the head of YÖK with Yekta Saraç. Saraç is publicly known as the brother of Fatih Saraç, who was nicknamed “Alo Fatih” after Erdoğan allegedly called him to manipulate the media, with recordings of the conversations released soon after the (now closed) Dec. 17 and 25 corruption probes. There has been no Treasury undersecretary for the last two-and-a-half months, since the former İbrahim Çanakçı left for his IMF post. There are reports that different wings of the government have been lobbying for different names for the position, a practice that Turkey is familiar with from past coalition governments. Meanwhile, Finance Minister Mehmet Şimşek has been subject to criticism within the AK Parti for revealing the real cost of the new Presidential Palace. In addition, Economy Minister Nihat Zeybekçi complained on Nov. 12 that there were five ministries in charge of different branches of the economy, too many to operate effectively, and suggested that two ministries would be enough. It was as if he is not a member of the government, but rather a spokesman for the opposition. Arınç, a veteran AK Parti personality, is officially in charge of the talks, but the HDP deputies who visit the jailed head of the outlawed Kurdistan Workers’ Party (PKK), Abdullah Öcalan, to give information and take instructions usually talk to another deputy prime minister, Yalçın Akdoğan, for debriefing after those visits. There is also public tension between the Energy and Labor Ministries following a series of fatal mining disasters. The competition within the government over the Foreign Ministry, despite the fact that it is currently headed by Mevlüt Çavuşoğlu, is now also easy to observe for an outsider. These are just some of the examples causing business circles to ask whether something is bubbling beneath the surface in the government. Perhaps Davutoğlu could give an answer to this after his return from the G-20 Summit in Australia next week. Recep Tayyip Erdogan’s new residence is four times the size of Versailles, comfortably exceeding the grandeur of Louis XIV of France. The new president has been accused of behaving like a “sultan” after he installed himself in the biggest residential palace in the world, built for a price tag of £384 million. 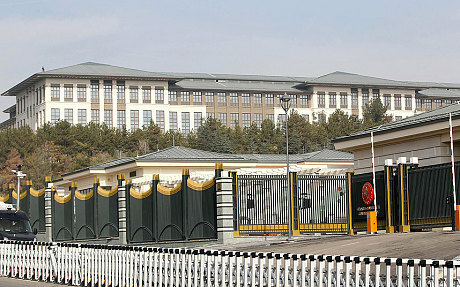 Recep Tayyip Erdogan now resides in the White Palace, which was constructed in breach of court orders in protected forest land in the capital, Ankara. Boasting 1,000 rooms covering a total floor area of 3.1 million square feet, the palace is four times the size of Versailles, allowing Mr. Erdogan to exceed the residential grandeur of Louis XIV, the “Sun King” of France. Inside the palace, a majestic hallway leads up to a sweeping staircase. The quixotic architectural style seems to cross the Ottoman and Seljuk traditions with that of a modern Chinese railway station. The bathrooms have silk wallpaper and the whole edifice is surrounded by a forested park. Hundreds of trees were felled to make way for the president’s new home. Mr. Erdogan, who designed much of the White Palace himself, has also taken the precaution of installing an underground bunker. Mehmet Simsek, the Turkish finance minister, said the total cost of the complex amounted to £384 million – twice the earlier estimate. 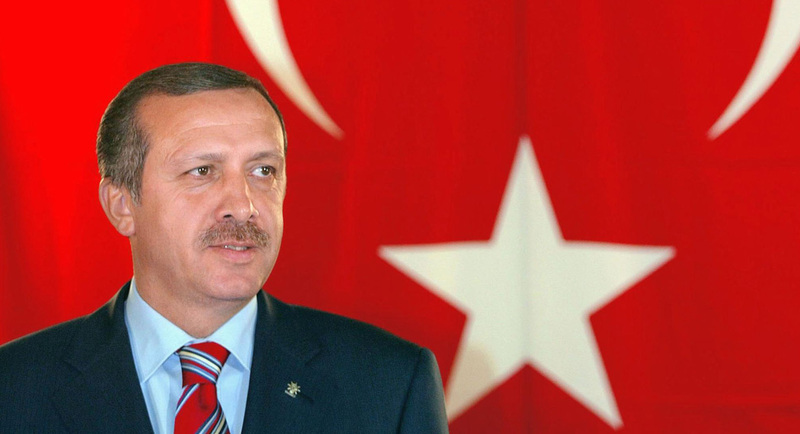 Mr. Erdogan served as prime minister for 11 years before ascending to the presidency. Although his AK party does not hold the two thirds majority in parliament required to amend the constitution, his ambition is to turn this traditionally ceremonial post into the new centre of power in Turkey. Unlike all previous presidents, Mr. Erdogan routinely chairs cabinet meetings. He has also spent £115 million on a new presidential jet, designed and supplied by Airbus to his own specification.